Known for it's Key West style architecture, Jupiter Key offers homes with views of the fabulous Atlantic Ocean. This small gated community and beautiful architecture is a must see for anyone looking for a home close to the beach, here in Jupiter. 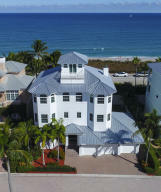 There are a lot of great homes in Jupiter Key. You can view the properties below by clicking on the full listing or the picture. Jupiter Key is a great community here in Jupiter, but you can use our Jupiter homes for sale site if you would like to see more homes here in Jupiter.